When I was younger, my family and I would go to Colorado almost twice a year. We would visit my mom's best friend from elementary school who lives near Denver. She has kids around me and my brother and sister's age, and we always had so much fun hanging out with them. I loved going there during Christmas. We would decorate their house, and they always had this massive tree in their living room that I completely enjoyed. One of my favorites things that we did was making sugar cookies made with spelt and decorating them with sprinkles and frosting. This year, I want to make some of the same cookies-you have to try making cookies with spelt flour. It tastes amazing! 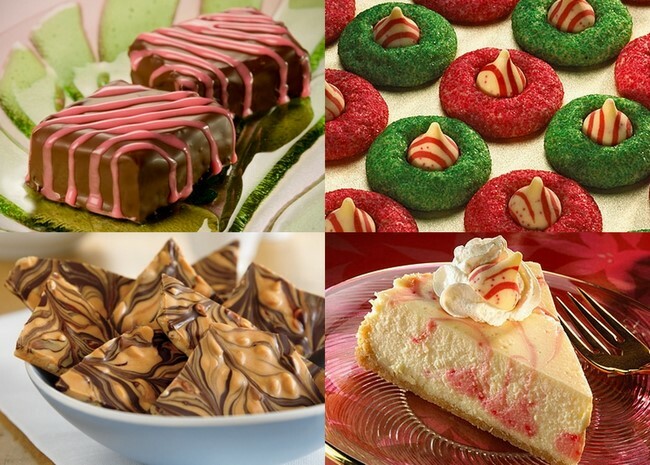 I'm also going to try and bake a few things that I haven't before like the Candy Cane Swirl Cheesecake, Peanut Butter Bark, Brownie Petit Fours, and Candy Cane Blossoms pictured above. :) What are your favorite things to make this time of the year? Those peanut butter blossoms look SO festive. I think I will try that this year...hopefully they will turn out. Thanks for the inspiration. Stop it!! Oh my goodness, yum! I have to make those candy cane blossoms before Christmas..
My mom and I are making Christmas cookies Tuesday- perfect time to read this post and get some inspiration! :) Thanks Natalie!